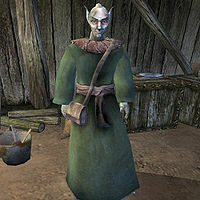 Daren Adryn is a Dunmer drillmaster and Bully of the Camonna Tong living in Gnaar Mok. He is the local Camonna Tong bigwig and can be found in Nadene Rotheran's shack, their local meeting place. He is soft-spoken, but ruthless. He has been threatening Thieves Guild member Ahnassi, attempting to pressure her into betraying the guild to receive "protection" from the Camonna Tong. Ahnassi is very afraid of him, and if you are male, she will ask you as her "special friend" to kill this "bad person". If you ask him about Ahnassi, he will deny everything, and advise you not to bring up the subject again. If you still do, he and the other Camonna Tong members in the shack will turn hostile and attack. Daren wears a common robe along with matching shoes. He also carries a demon tanto. Aside from his natural resistance to fire and the sanctuary provided by his ancestors, he knows no spells. "Don't push your luck, mister." "Never heard of her. And none of your business if I did. So blow, like smoke, or I'll spill you like a baby's cup." Ahnassi, a Special Friend: A great romance awaits for those male characters brave enough to try. Daren Adryn does not exist until the related quest has been started. This page was last modified on 29 May 2014, at 05:00.